I took a fairly long day trip today after Mass at Mt. Irenaeus and eventually I made my way to the edge of the Erie Canal near Bushnell’s Basin just east of the Village of Pittsford, New York. It was a beautiful day as temperatures reached the high sixties and many folks were either jogging, cycling or walking along the towpath on the opposite side of the canal from where I took this picture. 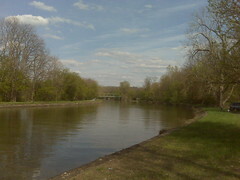 I’ve had a fascination with the Erie Canal that goes back to my childhood when I first began to read about it. My great-grandparents, Welsh immigrants to this country made their way to Upstate New York along this waterway. In fact, Richard and Catherines Owens might well have looked upon the spot where I stood today as they made their way from Castle Garden in New York City where they first entered the United States. My grandmother was their youngest child and she along with five of her seven siblings were born in the United States. Two of Grandma’s eldest sisters were born in Wales and made their way along this water route with their parents to Western New York. That was nearly one-hundred and twenty years ago. This entry was posted in Uncategorized and tagged Bushnell's Basin, Castle Garden, Erie Canal, immigration, NY, Pittsford, Wales. Bookmark the permalink.